"But when you get into the digital-business scenario of direct to consumer and channel marketing and leveraging an ecosystem and applying geospatial, now you're talking CEO language," McDermott said. SAP's going all-in on its belief that its bigger and broader portfolio of SaaS applications—including broad sets of apps for HCM, ERP and CRM—will give it a significant competitive advantage over Salesforce because SAP's wider range of apps will allow its B2B customers to know more and understand more about their consumers—and that those deeper insights will help those B2B companies create new business models centered on what customers want rather than what the seller happens to be able to deliver. "With the SAP Cloud Platform and all the assets that we have, we're in a pole position to create a different argument with the enterprise at the CEO level because as they digitize their business on an end-to-end basis, now we have all those assets plus CRM to go head-to-head with anybody else that's out there." Using SAP's recent digital-transformation engagement with Emirates Airline to highlight that distinction, McDermott hammered on the paradigm shift in the CRM market away from an orientation around the salesperson to a 360-degree focus on the customer. "Emirates is a great example in terms of next-generation CRM versus Salesforce pipelines and leads and forecast calls. We're now talking about next-generation business modeling for the perfect customer experience, including the financial implications of what seat they get, what treatment, what service provision that they get, including customizing the trip just for them," McDermott said. "So if I'm in coach, but it's my birthday and I want a bottle of champagne, in that customer experience online I expect you to deliver that, Emirates. So that personalized CRM—down to the individual consumer calling the shots—is where it's going," McDermott explained. "It's the customer's customer, it's mass customization at scale in a highly personalized way—and that requires a common data model, a common platform and an unbelievable end-to-end capability so that you can satisfy the perfect experience. "That's the new CRM. That's the one SAP intends to take over." That's a compelling model that aligns the rapidly emerging—and rapidly rising—expectations of the digital-lifestyle consumer with the essential capabilities of data-driven digital enterprises. And it happens to be one about which Salesforce.com is keenly aware, as evidenced by its recent acquisition of API maker Mulesoft. Indeed, Salesforce offers much more than salesforce-automation tools—Marc Benioff's company has become a powerful force in helping various types of businesses not only reimagine but indeed create powerful new customer-engagement and customer-experience models and processes. But McDermott's underlying mission is intended to completely disrupt the traditional CRM space with a series of elegantly interlaced applications that begin to unify the traditionally separate and often-disconnected worlds of the demand chain and the supply chain. 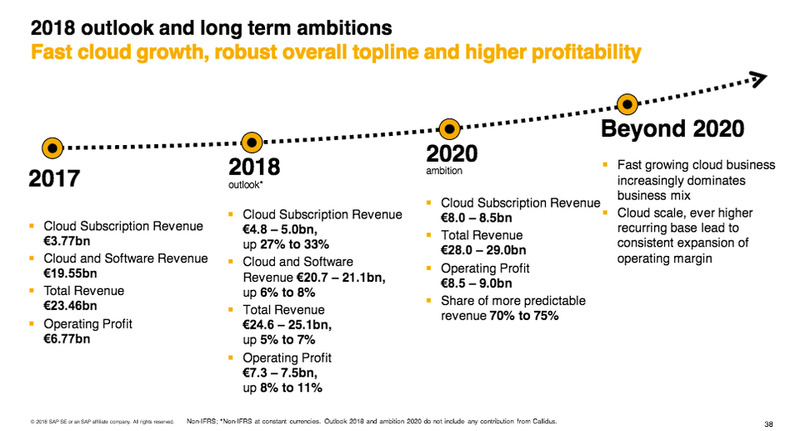 SAP believes it can grow as fast as its major cloud competitors while also retaining its very large traditional business thru 2020. That's become a large-scale goal for many of the leading tech companies—SAP, Salesforce, Microsoft, Oracle and others—but what stands out about this latest proclamation from SAP is the richness and specificity of its plan, as opposed to the high-level but low-detail visions that have become the norm in this space. And McDermott is hoping to raise doubts about the ability of category-king Salesforce—and/or any other current CRM providers—to be as successful in a world where the boundaries of CRM are being revised to encompass the entire data-driven and digital customer experience. Central to SAP's emerging strategy is its ability, through its enterprise-wide suite of applications, to let companies understand and engage with their customers from across all facets of business operations, rather than just through interactions with salespeople. Whirlpool, a huge SAP customer, was a featured speaker at the SAP event for financial analysts and CIO Michael Heim described how SAP Hybris and related tools have helped Whirlpool revolutionize its business. "One of the big opportunities for us is almost all shopping begins online, as we all know, and increasingly it's going more and more direct-to-consumer," Heim said. "We're still largely a business-to-business player today, but we really needed the opportunity to both upgrade our capabilities on our B2B platforms and upgrade our capabilities in direct-to-consumer as we start to look at end-to-end business models. "And it's Hybris that will help us do that," he said, emphasizing that Whirlpool's emerging strategy and its new B2C business will demand radically different approaches to customer engagements. "For us, it's all about product excellence and speed to market, changing the nature of our product, winning in the digital consumer journey and then reinventing our supply chain, we think is really important to how we're going to choose to compete," said Heim, noting that Whirlpool's transformation involved much more than adding new SaaS apps—it also required upgrading traditional systems. "And upgrading these landscapes allows us to run like clockwork so we can focus on all these other spaces that are really new and different for us as we move from being a largely product company to a consumer company where we're going to be much more intimate and much more embedded into their homes," Heim said. "Believe it or not, your dryer wants to talk to your thermostat and you actually want to talk to your oven—I mean, who would ever have thought of that?" And that's precisely what McDermott means by offering a complete end-to-end set of capabilities to businesses. So, in that context, let's take a look at precisely how SAP intends to overhaul customer expectations for what CRM is and the type of business value it can—and should—deliver. Bernd Leukert, CTO of Product and Innovation and a member of SAP's executive board, spoke about the need to offer supply-chain and logistics data to ensure highly customized deliveries of products. "Imagine a personalized product without the ability to have the related supply chain—and if it's in the manufacturing industry, the related manufacturing where the semi-finished product is married to the customer-order information, and then you need to be able to link that product exactly to the destination address. "That," said Leukert, "is a scenario Salesforce cannot offer today. And we see that in that combination, our portfolio is exactly addressing the need." "With Hybris, we got omnichannel e-commerce." "We have our own SFA and marketing that we have developed organically." "We tucked in Gigya [a recent acquisition] so we would have the customer profile and the GDPR requirements of that customer under control in an omnichannel e-commerce world." "And recently, we announced Callidus because we want to own the lead-to-cash process. So we're deep now into the psyche of the sales professional because we're in their pipeline." "We're now into how they configure price and quote a service or product—and that also ties to how they get compensated on that sale..... We use it ourselves to run SAP. It's a nice tuck-in, and it's going to present enormous challenges for our competition." McDermott then described the knowledge gap faced by Salesforce because it doesn't compete in the ERP space, a point recently echoed by another major rival, Oracle. "Because the thing that our competition cannot do—because they don't have ERP—is have a common data model. But we do, with HANA. And we now have all of our CRM assets in the cloud, where we can connect the end-to-end value chain in 25 industries," McDermott said, adding that SAP is building AI and machine learning into all of its applications. "You don't have to take the data out and throw it into a supercomputer—the data is built into the application just as the intelligence is built into the application. "So now I can see my consumer on an end-to-end basis in every industry in every corner of the earth, and I support the whole value chain with a modern ERP on the only in-memory data platform that scales the way HANA does. And we can fulfill on the back-end, front office to back office, seamlessly," he said. This is another striking example of how the biggest winners of all in the Cloud Wars will be the business customers that get to choose from the spectacular innovations being turned out by all of the cloud vendors mentioned in this article—SAP, Salesforce, Microsoft, Oracle and others—as the relentless competitive dynamics continue to drive higher and higher levels of business value. For SAP—which for a few decades was synonymous with ERP—the move into the CRM space that it plans to turn upside-down is one that the spirited McDermott takes very seriously. "And we are now taking all this know-how in the cloud back into CRM. We want CRM," he said.